They say that half of marketing is creativity and the other half promotion. It’s definitely true of running a successful social media contest. 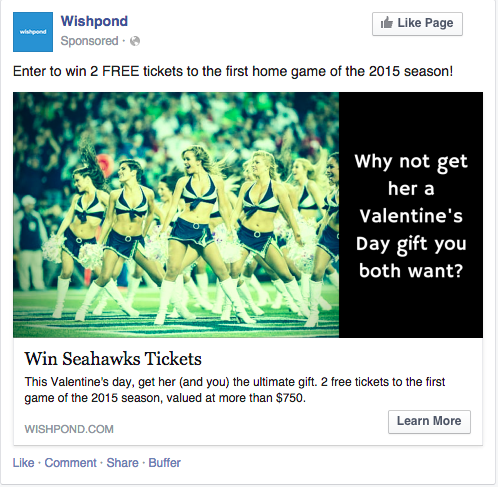 This article will explain how to use Facebook Ads to promote a contest. Rather than give you the full background of advertising on Facebook I’ll skip straight to the actionable stuff. (If you need that background, I’d recommend our free guide to Facebook Ads). This article will give you a step-by-step walkthrough to creating, designing and targeting your first successful Facebook Ad for your social media contest or competition. As soon as you arrive you’ll see 9 options for your ad objective. For the purposes of contest promotion we’ll be choosing either “Send people to your website” or “Increase conversions on your website”. If you go with the conversions option you’ll need to place a conversion tracking pixel within your website’s code (so that Facebook can “see” the number of people your ad has sent there). If all that confuses you, either download my Complete Guide to Facebook Ads or check out “How to Use the Facebook Ad Conversion Tracking Pixel to Track E-Commerce Checkouts” (it’s all in there). 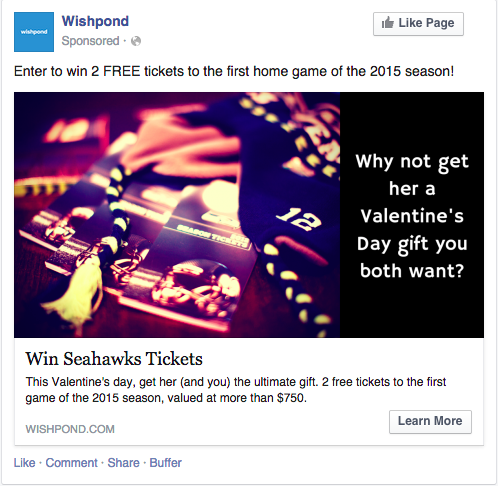 Your contest’s Facebook ad needs to grab the attention of your Fans and non-Fans. Remember that it’s competing (no matter if you choose to place it on the side-bar or the newsfeed) with people’s family and friends: pictures of their cousin on a beach in Tahiti; a video of their friend’s wedding; their own fascinating picture of a sunset which already has 3 Likes! That’s a tough environment, so let’s put some time into making your Facebook ad snap. Keep your headline short and snappy with word like “Free,”, “New,” “Today,” “Exclusive” etc. 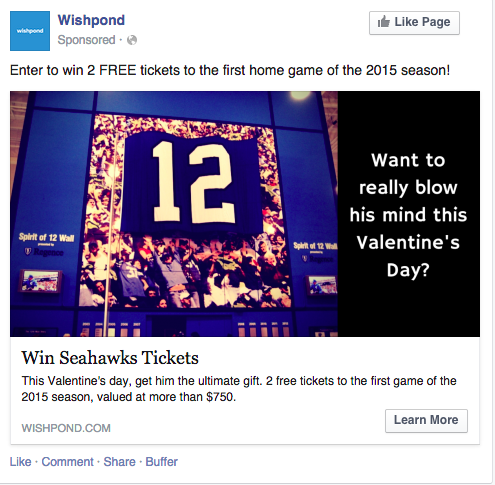 Only last week I took a look at “ 13 Facebook Ads We Got that Were Right on the Money (and Why)”. I dissected each of those 13 awesome ads into their individual parts and gave them a rating based on targeting, design and copy, so that might be worth a look. I’m not going to wax on about how amazing Facebook’s targeting capabilities are. You’ve heard it all before, and if you haven’t, just trust me on this one (they’re genuinely unparalleled). So, we’re trying to do one of two primary things with your contest yes? Either way we want to target people who are not currently your own Fans (because we can turn existing Fans into leads without paying for it, and there’s no point turning existing Facebook Fans into existing Facebook Fans…). I’ve found the best way to teach Facebook ad targeting strategy is by using an example. For my contest I exclusively want to attract people likely to become customers in the future. Initially I can do this by offering a prize related to my business, and secondarily by targeting my target market with a Facebook Ad - ensuring only people likely to become customers will see it. 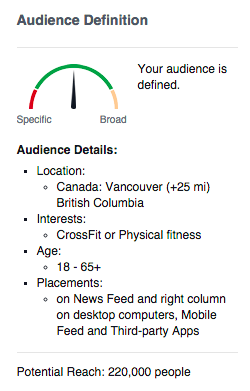 So I head to the “Interests” box to target people who have Liked or “expressed interest in” Crossfit (my target market). Because only targeting people Interested in Crossfit doesn’t give me an audience large enough to find success (I want at least 100,000 possible reach) I’ll add “physical fitness” and see what we get. You can see the target audience this would create on the right. Alternatively, I could venture that the friends of my existing Fans are likely similar to my Fans in ways I can’t anticipate. Facebook gives us the option to target solely people who are friends with my existing Fans. At the bottom of my ad manager I click on “Advanced Connection Targeting” and exclude “people who are connected to” (my existing Fans) and focus instead on “people whose friends are connected to” my Facebook Page. You can see what that would look like on the right. This will also display the name of my targeted audience’s mutual friend at the top of my Facebook Ad - this increases both trust and click-through-rates. Let’s say your sports apparel store was giving away tickets to a Seattle Seahawks game. 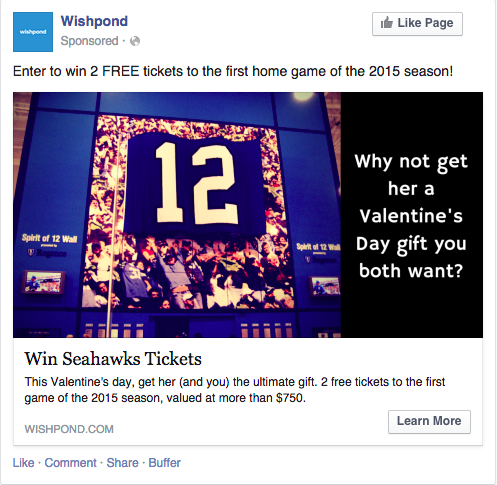 You could simply target all Seahawks fans in Seattle; or you could put a bit more effort into it and run a Valentine’s day promotion, targeting exclusively wives and girlfriends in Seattle with the ultimate gift. 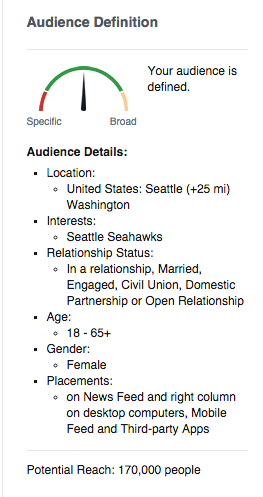 So notice that I’ve been able to target my contest’s Facebook ad at women, in a relationship, who are interested in the Seahawks NFL franchise (that’s pretty specific!). I’ll happily guarantee that the cost-per-click of this ad would be lower than a generic “win free Seahawks tickets” ad targeting everybody in Seattle. This ad has the exact same ad copy and image, but different text in the image and a different target audience. I highly recommend, if you’re changing your ad’s audience, that you change its look as well. The more you cater to your audience the higher your level of engagement will be. Testing is essential in all aspects of marketing, but especially in advertising. I can’t tell you how many times I’ve seen ad click through rates double or triple because of a small change to image, copy, headline or target audience. Contest advertisements are no different. In order to start testing the variables on your Facebook ads, simply make your first ad. The next time you log in you’ll be sent to the next stage of the Facebook ad platform, a stage which allows you to create ad campaigns and multiple ads directed at the same landing page. You’ll also see your ad’s performance next to the rest of your ads, allowing you to determine which variable is working best for you. Using reds, oranges and greens as accent colors in your ad images. I like my copy, but I’d be interested in seeing if a different image would engage better with my male audience than the “12” image above. Featuring your prize is always an essential part of a contest’s success, and this is just as true in your promotional strategy as it is in your contest landing page. I’ve also filtered the image to make it stand out from the Facebook newsfeed (with a “rose” filter). As the image itself is primarily blue and white, the filter will help it be seen. We’re trying to create a Facebook ad that stands out to a user as they’re scrolling down their Newsfeed. When doing this, we have to consider our target audience and their interests. As with the rose filter on the Facebook ad above, I’ve also added a greenish tint to this ad’s image. Hopefully this entry-level Facebook marketing guide will give you some inspiration and drive the success of your contest. Facebook ads aren’t a intimidating as many marketers believe, and allow you to promote to people you would never otherwise be able to. Have you promoted a contest with Facebook ads? What were your results, frustrations, successes? Let me know in the comment section below!